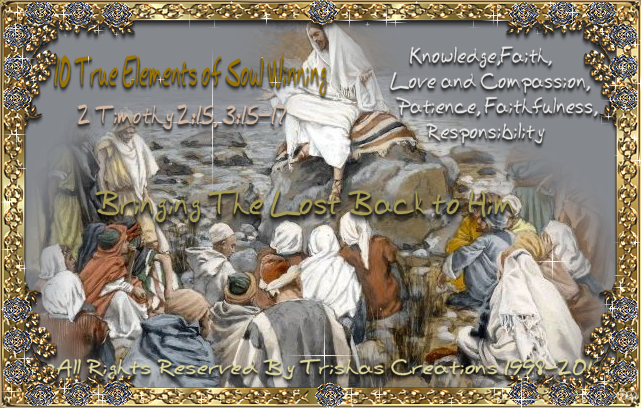 "10 True Elements of Soul Winning"
Welcome to "10 True Elements of Soul Winning"
People think soul winning, is getting up on stage and singing their hearts out, and then not looking back when they are finished. Some, actually believe that when they are popular and or stars that they are doing their jobs as Christians on bringing souls in for Christ. Singing is a beautiful thing, and can be used for different reasons, even evil, but when we are "Soldiers for Christ" we need to know how to the proper way to bring other's into Him. Not, just by our singing or them watching how we carry ourselves. We must know how to actually be conquerors to bring sinners back to Christ. I was amazed that I found this, and wish I could've gotten online before now, because I always wondered "how am I to bring other's into Christ, when no one wants to even listen about Him" I didn't know the steps and the how to's, but now I do and I pray this helps you to. Whether, or not you are aware that it is "OUR JOBS" as Followers of Christ to help bring other's in that need to be saved, and if we know or haven't tried then their soul is on our hands. Facebook for instance , is a good thing but then again it's a very bad thing. The good thing about it is that we can just about post whatever we want, even the filthy stuff that FB deems to be ok to be shown to millions, but then again it's a Blessed thing if it's used in the right way. Some, fiddle daddle around play games, listen to videos, and or have screams and shouts of anger and blasphemy and not even care who else is really seeing all that mess. Some, get on to pray with one another, send prayers out, start Christian Groups to help bring other's in to Christ, but then again there are some who love to join groups that abuse them. So we all need to know the proper way to do what God counts on Us to do , and that is Bringing The Lost Back to Him! The ability to do and say the right things at the right time and place. 3. Knowledge Clear understanding of the Word of God and how to use it. 4. Faith Absolute conviction regarding God, His Word, and Gospel results. 5. Love and Compassion Devotion to and mercy on lost souls. 7. Patience Self Control, Calmness, and Endurance, Perverseness, Forbearance. 9. Appreciation Keenly aware and sensitive of the value of Lost Souls. Morally and Legally Obligated and Responsible for the Salvation of Lost Souls.